iGrid T&D solutions have been tested with most of the leading manufacturers of smart meters (Landis&Gyr, Itron and Circutor). iGW Smart Metering series uses the most popular metering protocols: IEC60870-5-102, DLMS and Modbus. iGW devices collect real-time information from all the meters in the facility, with reads taken at really short intervals (every 2-4 seconds). Metering data can then be transferred to control center/s via any kind of communication network available in the plant (GPRS, VSAT, analog radio, Ethernet, etc.) using standard communication protocols (IEC60870-5-101/104, Modbus, DNP3.0). iGW series products have been tested with most of the leading manufacturers of smart meters (Landis&Gyr, Itron and Circutor). 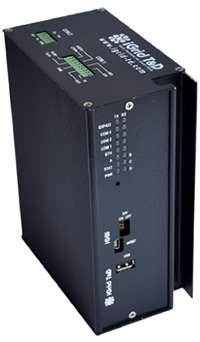 (1) EXP422 port (RS422/485 software configurable), for connection to iRTUe devices, or to other devices. Power supply options: 24Vdc, 48Vdc or 125 Vdc (-20%, + 15%). Contact iGrid T&D for other power supply options. Fast logic blocks, commonly used in electrical facilities. Fully user configurable programming of logic and automatic functions by programmable state machine.